oh joy! the 18th bundle arrives. | six words to change the world. ← my confidence boosting present to you. oh joy! the 18th bundle arrives. We all have hobbies. I like to think of mine as travel (because that sounds cool), but it’s probably reading US Weekly and the Huffington Post nonstop. For Jim Bob Duggar and his wife, Michelle, I would venture to say that their hobby is having babies. The Duggars just welcomed their 18th child into their crazy world. Little Jordyn-Grace Makiya was born on December 19. Now I love babies. I coo at every one I see. I love the little clothes, the little shoes, etc. Perhaps I’ll have one or two in my lifetime. But my god, the thought of 18 babies WITH NO INTENTION OF STOPPING makes me a little queasy. Yes, Jim Bob told the press “We both would love to have more”. Sure, buddy. 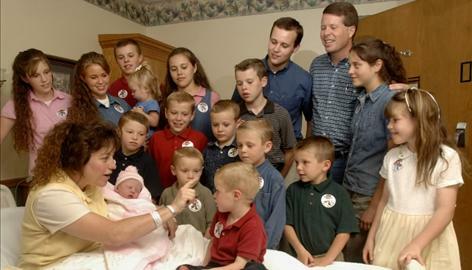 Michelle Duggar has been having children for over 20 years. And as if it couldn’t get any more bizarre, here are their names and ages. ALL J NAMES? WHY WHY WHY? (Ginger with a J? Seriously?) You could probably guess this by the freakshow nature and all the babies, but the Duggars have their own show on TLC. It’s called ‘Seventeen and Counting’. That’s original. But will they have to change the name now? This family seems a little strange. I’ll take ‘Jon & Kate Plus 8’ anyday. They are awesome.